Timers and Counters are used in a large variety of Processes. From testing to coatings to fillers timers aid engineers, scientists and technicians in running tests and processes. Timers give feedback of number of pieces, number of operations, or test status. With a 4 digit display, this timer offers a relay output to be switched at pre-programmed intervals according to eleven different timing functions. The LED display shows the running time and the digital inputs execute start, hold and reset functions. Dimensions: 48x48mm x 100mm (1/16 DIN). 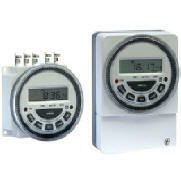 The weekly timers TM-619 and TM-6331 are used whenever electrical equipment must be periodically switched on and off at preprogrammed daily or weekly times. The programmed events are then repeated during the next periods accordingly. They find broad application in heating and refrigerating systems, boilers, ovens, dryers, defrosting equipment, swimming pools, hatcheries, illumination, etc. 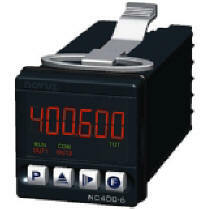 NC400-6 is an advanced 6-digit counter that also performs batch and totalizer counting operations. It has two outputs with independent and configurable presets that can be triggered based on counting, batch or totalization values. Its 2 outputs allow for an independent timed triggering. 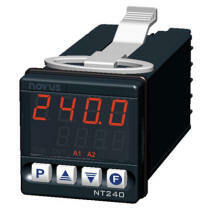 The counting inputs can be configured to connect dry-contact, voltage pulse, NPN or PNP sensors. Sensors may be powered by an internal power supply. Counting mode can be configured as progressive, regressive, quadrature, sum or subtraction. Several reset modes - automatic or manual - can be configured. Manual reset can be generated by a digital input or key from the front panel. Inputs from NPN or PNP proximity switches, contact closures, digital logic, magnetic pickups down to 12 mV, or AC inputs up to 250 Vac. Serial communications: Ethernet Interface, Ethernet-to-RS485 server, USB Interface, USB-to-RS485 server, RS485 interface (dual RF11), RS485 Modbus interface (dual RJ45), RS232 interface. Accepts a 4-20 mA, 1-5V, 0-5V or 0-10V input signal. Drives four (4) independent 4-20 mA outputs proportional to input. Outputs can share a common ground. Grounds of input and outputs can differ up to ±10V. Opening any output loop does not affect other loops. ±10% zero and span fine adjustments for each output loop. Indicator LED for each connected output. Powered by 85-264 Vac (Model QLS-1) or 10-48 Vdc (Model QLS-2). Powers a 2- or 3-wire input transmitter at 24V with up to 30 mA. 22.5 mm (0.9") wide case snaps to 35 mm DIN rail. Weighs only 159 g (5.6 oz). Note: Prices shown are for reference only, and may change without notice. Contact Advanced Industrial Systems, Inc. for firm price quotations. Copyright 1997 - 2013 Advanced Industrial Systems, Inc. All rights reserved. Last modified: Wednesday October 23, 2013.